The Battle of Basra was a battle of World War I which took place in the city of Basra (modern-day Iraq) between British and Ottoman troops on November 10, 1914. The battle resulted in the British capture of Basra. After the capture of Fao by the British, the Ottoman army began to converge on Basra. The British feared that the Ottomans were preparing to attack Fao, so they decided to defeat the Ottoman army and capture Basra. On November 7, 1914, British troops began the march from Fao to Basra. The Ottomans sent cavalry to stop the British advance, and there were many battles between the British infantry and the Turkish cavalry between November 7 and 9. 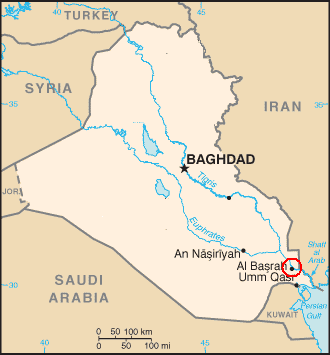 Despite this, the British arrived outside Basra on November 10. The Ottomans retreated from Basra, leaving only a few hundred troops to guard the city. The British attacked Basra and within an hour the remaining Turkish troops were defeated and Basra was occupied. Even though the British captured Basra, they did not accomplish their goal of destroying the main Turkish army, which had now retreated to Kut. The failure of the British to win a decisive battle would result in many more campaigns in Mesopotamia. Reaching Abadan on 7 November Delamain's force quickly dispersed light resistance before establishing a fortified camp some 5km further up the river. Delamain repelled a dawn attack launched by 400 Turkish troops on 11 November at heavy loss to the Turks. Within the space of three days a further 7,000 Indian troops had been added to Expeditionary Force D, along with light artillery.